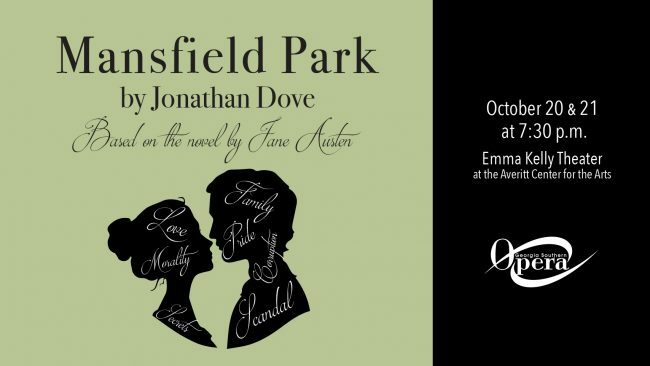 The Georgia Southern Opera (GSO) will present Jonathan Dove’s opera Mansfield Park at the Emma Kelly Theatre at the Averitt Center for the Arts on Friday, Oct. 20 and Saturday, Oct. 21 at 7:30 p.m. Admission is free and open to the public. The production, based on the classic Jane Austen novel of the same title, Mansfield Park, is completely cast with Georgia Southern students and is directed by Stage and Program Director Arikka Gregory, D.M.A., and opera coach, conductor and pianist Jonathan Murphy, D.M.A. Gregory promises a treat for music lovers and Jane Austen fans alike. The opera begins with the protagonist Fanny Price at the age of 18 and illustrates faithfully her complicated relationships with her more fortunate extended family as well as their ethically suspect friends. To learn more about GSO and other University ensembles, visit http://class.georgiasouthern.edu/music/ensembles/.